Molds are part of the every day natural environment. They play a key role in the decomposition process outdoors breaking down fallen leaves and dead trees. Indoors however, mold growth should be avoided. Mold spores float through the air, naked to the eye and when they come in contact with surfaces that are wet, they begin to grow. Mold will not grow without water or moisture. Flooding, leaking or broken pipes, leaking roofs, improperly installed vents are often places where moisture sits and invites mold spores to grow. All construction can host most whether it be new or old. Molds do have the potential to cause health concerns as well as structural damage to the building as mold causes deterioration. This decomposition produces allergens which can cause allergic reactions, irritants and mycotoxins which are potentially toxic substances. Residents of buildings with mold can potentially have hay fever-type symptoms, such as sneezing, runny nose, red eyes and skin rash. These are common reactions to mold and can be immediate or delayed. Molds can also cause problems for people with asthma. Molds can also cause eye irritation as well as irritations to the skin, nose, throat and lungs. Mold will not grow if the mold is removed and the moisture source is fixed. 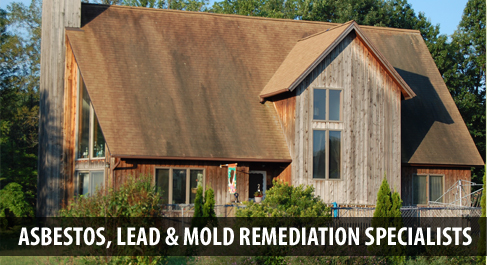 T.J. Bell Environmental, Inc. is a company that can help you get rid of the mold.